Below is the Script to video, note that this is not an article and is probably not really meaningful without the video. A German Tank division in 1939 consisted of about 12000 men. 3000 of them were assigned to the Tank Brigade, 3200 to the motorized infantry brigade and 1200 to the artillery regiment. The remaining 5600 were assigned to supply, recon, engineering, anti-tank, signaling and staff units. Now let’s take a look at the composition of the tank brigade. It consisted of 90 Panzer II, 162 Panzer III, 60 Panzer IV and 12 Panzerbefehlswagen – a command tank. Hence, a total number of 324 tanks. But this was the intended composition. So let’s take a look at actual composition. These are the numbers for the “Erste Panzer Division” the First tank division. It had 93 Panzer I, a tank never intended for combat and only armed with machine guns. 122 Panzer II, a mere 26 Panzer III, 56 Panzer IV and 12 Panzerbefehlswagen. Thus, giving a total of 309 tanks, slightly below the intended size, but numbers without context are like most politicians, quite useless and untrustworthy. On the left side the intended setup, with a lot of Panzer III, which was back in 1939 the main battle tank of the German Army. Yet on the others side we have a lot of Panzer I, a tank never intended to see combat. But the Panzer I needed to fill most the ranks of the missing Panzer III. Also the Panzer II was no proper substitute for the Panzer III or Panzer IV in terms of combat performance. Now, a closer look on the planned organization and structure of the Panzer formations. The Tank brigade consisted of 2 regiments with 2 battalions each and each of these battalions consisted of a staff company, two light companies and a medium company. The “Stabskompanie” or Staff Company, consisted of a Signaling Platoon with two Panzerbefehlswagen and a Panzer III. Note that the Panzerbefehlswagen looks like a Panzer III, but it only had a fake gun and turret was welded to the hull. Yet, it was crucial to the performance of the German Panzer units, because it provided important command & control facilities. Furthermore, the company had one platoon of light tanks consisting of 5 Panzer II. So let’s take a look at the two light tank Companies or “Leichte Panzerkompanie”. They consisted of a Company Section with two Panzer III. A Light platoon with 5 Panzer II and three platoons of 5 Panzer III each. Finally, the Medium Tank Company or “Mittlere Panzerkompanie”. The Company section with two Panzer IV and the light platoon with Panzer IIs are almost identical to the light companies. But the three platoons all consist of 4 tanks each instead of 5 tanks. Time to take a look at the big picture again. These companies made up one battalion with 71 tanks. Thus with 4 battalions for the Brigade there is a total of 284 tanks for frontline duty, since some tanks were kept for reserve and command duties. Now, again this was the intended setup, the number of available Panzer III was very low, thus their roles needed to be filled by other tanks like the Panzer I and Panzer II. (1)	The number of tanks for 1939 in the 1. Panzer Division is from Jentz p. 90 (see sources). (2)	The Numbers of men is according to Müller-Hillebrand S. 163 (see sources) and Niehorster (see sources). (1)	This is the „ideal/planned“ layout of German Panzer Division in World War 2 as orderd for the 1. Panzer Division. With the Kriegsstärkenachweisungen (K. St. N.) 1103 (Sd), 1194 (Sd), 1168 (Sd), 1107 (Sd), 1171 (Sd), 1175 (Sd), 1178 (Sd) from the 1st September 1939, due to the war and a general lack of tanks on the German side the division probably never reached this setup, especially since the Panzer Division got restructured again and again. 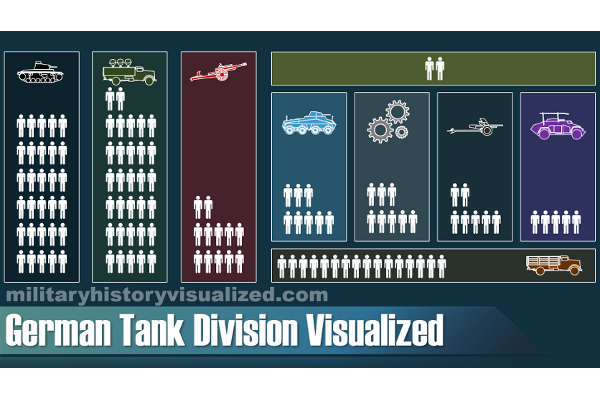 From 1939 to 1941 the number of tanks in a Panzer Division decreased by almost 50 %. (2)	Furthermore, the types of armored cars represented in the video is simplified. I know there were around 90 armored cars (Niehorster link) in the division, but I could only determine the exact types and numbers for 56 of those 90. They were Sdkfz 221, Sdkfz 222, Sdkfz 223, Sdkfz 231, Sdkfz 232, Sdkfz 274, Sdkfz 260, Sdkfz 261, Sdkfz 263.